Those of you who hail from a different age cohort than mine (sorta tail-end-not-quite-100%-HippieZone- Baby Boomer-Brady Bunch era) probably have no idea who Davy Jones was, but for those in that group, no explanation is necessary. Davy Jones was the lead singer of a phenomenally popular (at least for a few years in the mid- 60s) group called The Monkees. The Monkees were incarnated as a made-to-measure pop group assembled by Bert Schneider and his partner Bob Rafaelson (later the director and co-writer of “Five Easy Pieces”, starring Jack Nicholson). They were meant to capitalize on the huge success of the Beatles with the younger generation. “The Monkees” only aired on TV for two seasons, but it was a huge phenomenon, especially in my demographic (girls under 12). The show, a not-too-subtle reprise of the Beatles’ trendsetting film “A Hard Day’s Night”, introduced America to four fun-loving, wacky guys who called themselves The Monkees, loveable musicians who were “ too busy singing/to put anybody down.” Not all of the men who made up this supergroup were accomplished musicians at the start of the show’s run, but they soon developed their musical chops, and with the help of an amazing group of songwriters (Neil Diamond, Carole King/Gerry Goffin, Boyce and Hart, and others) and session musicians (including Glen Campbell) topped the U.S. charts for several years with hits such as “Daydream Believer”, “Last Train to Clarksville”, and of course, my not-so-favorite, “Valleri”, which over-enthusiastic grade-school types used to serenade me with (repeatedly), much to my chagrin. I left the Davy worship to my best friend, who was a rabid fan, but both of us bolted into our houses every week to make sure we didn’t miss the latest episode of the “The Monkees”. Many other neighborhoods, I’m sure, were swept clean of girls during that time period! Davy Jones was the Monkee with the most extensive experience in show business. In addition to working as a jockey, he was a child actor who had been in “Oliver”, both on the London stage and in Broadway production of the show. He’d also appeared in “Coronation Street”, the long-running British TV program. His good looks, British accent (“just like Paul McCartney’s!”), mop of dark hair, and general cuteness made him a natural front man for the new group, derisively known as “the Prefab Four”, and it didn’t hurt that his small stature and pleasant appearance meant he was the perfect dream boyfriend for pre-teen girls. And he didn’t scare their parents, either. The Monkees were meant to be a little hip, but not scarily so, like those hippies Middle America was reading about in the newspapers. Prior to his stint in the Monkees, Jones and the cast of “Oliver” appeared on the same Ed Sullivan show that showcased the Beatles’ explosive American performance, and Jones was noted to have commented that he’d love to be part of all that excitement, too. In a few short years, his wish came true. Soon, he and his love-bead bedecked bandmates were on the cover of every teen magazine in the land (anybody remember “Tiger Beat” and “16″?) as Monkee-mania took hold. Davy Jones even took Marcia Brady of “The Brady Bunch” to her high school prom. Even though the band was disparaged for being nothing more than teenybop pop, in recent years their reputation has improved, with the help of their dedicated fans and the enthusiasm of other musicians. Their music is being discovered and appreciated by new fans, their trip-a-delic film “Head” has a cult following, and Jones was touring with two of the other Monkees (Peter Tork and Mickey Dolenz) until right before his death. He’d also just finished a music cruise with another 60s phenomenon, Paul Revere and the Raiders. Let’s take a look at Davy Jones’ birth chart. Since no one seems to know his actual time of birth, there’s only so much we can do, but let’s use a noon birth time and run with that! Davy Jones was a Capricorn; his Sun is conjunct the planet Venus, also in Capricorn. The Sun/Venus conjunction is often found in people who have a pleasant appearance and/or are involved in the arts in some way. His Sun is also square Neptune, an aspect seen in creative people and musicians, which no doubt lent a “dreamy” aura to his persona as well, one that translated well during the “peace and love” years, when everyone was a bit fuzzy around the edges anyway. Jones’ outer planets Neptune in Libra, Uranus in Gemini and Pluto in Leo were connected with flowing aspects, which shows the possibility for him to become a mass media phenomenon and to be “on the radar” of the times. Jones was the “heartthrob” of the Monkees, (one of his recent quotes was that he “used to be a heartthrob” but was “now a coronary”, which proved unusually prescient given the manner in which he died). 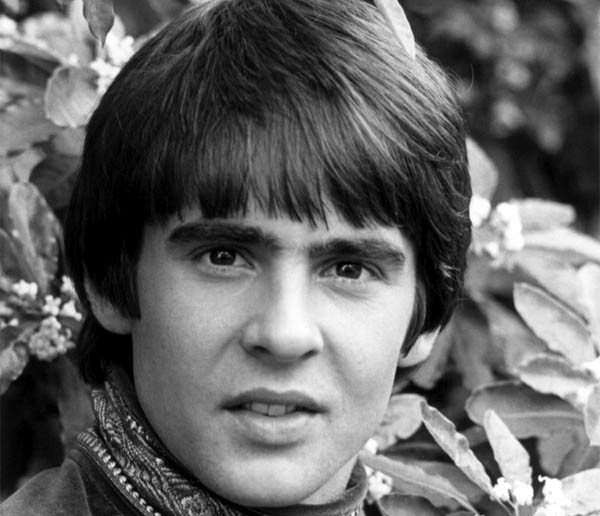 Davy Jones was the Monkee most of the young female fans fixated on for their first prepubescent crush. With the Sun and Venus in bottom-line conscious Capricorn, Jones knew how put all that charm and charisma to good–and profitable–use. He crooned most of the Monkees’ softer tunes and of course, all of their romantic ballads. Jones also had the Moon in Scorpio, which amped up the attraction/ intensity level and allowed him to connect emotionally with his young fans, each of whom imagined he was singing straight to them. Jones’ Mercury in Sagittarius opposing his Uranus in Gemini made him a quick thinker and someone who remained young at heart (and he probably was a bit eccentric, too–the “wacky” persona the Monkees projected fit him quite well). However, with Mercury trine Pluto, (plus that Scorpio Moon), not much got by him, as this aspect can show someone who has an instinctive understanding of what’s really happening, and the undercurrents behind the scenes of any situation. That same Mercury in Sagittarius connecting with Uranus can also show someone who has mass appeal, perhaps in a place far from their birth, or who travels a great deal. Jones was born in Manchester, England, but reached the height of his success with the Monkees in the United States, and at the time of his death was living in Florida. The Monkees used their television program as a means to broadcast their music, thus reaching many more people than they would have through just making records. They could be considered the forerunners of the music video, with their half-hour shows functioning as an extended promotion for their music and personas. Jones’ chart is also interesting in that it shows his charm, talent, and appeal, but also points to his determination and drive. He began working at an early age as a child actor, was a jockey for a while, reportedly gave up acting when his mother died, and then continued his career as a musician. The Moon trine Saturn adds emotional discipline, self-control, and maybe a bit of austerity, and with Mars conjunct Saturn in Cancer (both Mars and Pluto are retrograde), his early home life and relationship with his father were likely to have been strained or difficult–or his father may have been absent. Since Jones was a very private person, there’s not much documentation on his early life. The Moon in Scorpio trining the Mars/Saturn conjunction may hint that his mother eased the rough edges and was very important to him (as his ending his acting career upon her death would seem to indicate). Despite his polite manner and chatty sociability, there was probably a core area of Jones that was unknowable, particularly when it came to his close relationships. The Moon in Scorpio can be very private; Venus inconjunct Mars can show unstable relationships or relationships based on things that don’t ultimately last. Neptune in Libra can show someone in love with love and relationships, and the Saturn/Mars in Cancer combo probably meant he had to work on opening up to partners and in his home life. He was married three times and had four daughters, but there has been very little in the news over the years about his personal life–and I’m sure that was intentional. Secretiveness and protectiveness of his family and his privacy are things I would expect from this combination. Behind the cheery persona was a shrewd businessman. I’ve already mentioned the Capricorn Sun and Venus (“use your assets”), and the Scorpio moon adds a touch of “damn the torpedoes/all or nothing” vibe. He also had Moon trine Mars, showing someone with a great deal of energy to expend. Mars square Jupiter and the Sun inconjunct Pluto add the urge to expand and push foward, plus a determination to have his own way at times. These aspects, plus his serious Capricorn Sun and Scorpio Moon, also meant that he never gave up and continued to build his career through the years. He had enough energy, ambition, and forcefulness to succeed at whatever he put his mind to, and was not the type to give up easily. One thing I’d like to note is that in his chart Jupiter is conjunct Chiron. Jupiter relates to horses and other large animals, and Chiron is the asteroid/planetoid named after a a half-man, half-horse centaur combo (that’d be Chiron). Jones started out as a jockey (he was 5’4″; his small stature was perfect for this occupation) and he died near his Florida stables, where he kept his horses. Bandmate Peter Tork joking referred to him after he died as the “Manchester Cowboy”. In Jones’ chart Saturn, ruler of his Sun sign Capricorn, is square Jupiter and Chiron, which most likely indicates that for Jones, being around horses was healing and that he felt “at home” in the stable and found the rituals and disciplines around horsemanship comforting. Since we don’t have an exact time of birth, I won’t spend too much time on the aspects surrounding Jones’ sudden death, but from all reports he was in general good health, took care of himself, was touring regularly, and his death, from a massive heart attack, was sudden and unexpected. 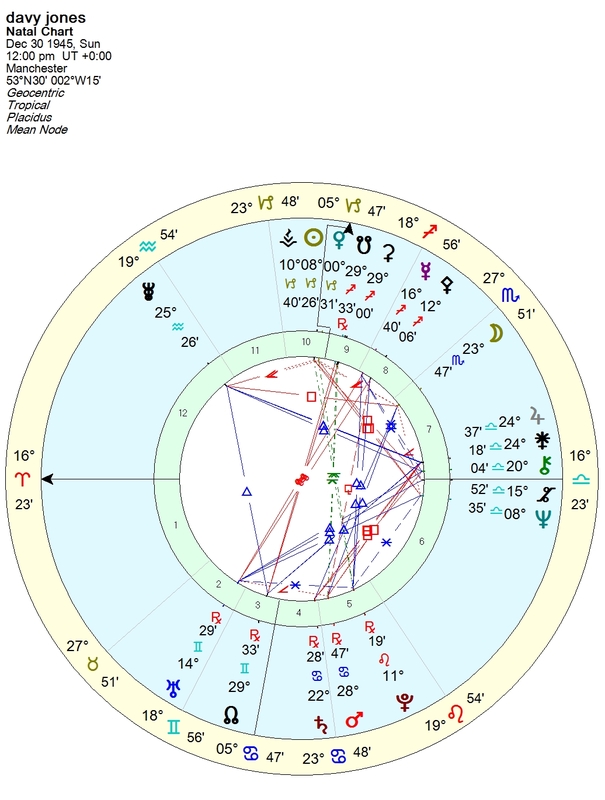 A heart attack fall can fall under Leo, and the ruler of Leo is the Sun, so looking at the Sun in Jones’ chart, we see that transiting Pluto was less than a degree away from his Sun in Capricorn, a very close connection, on the day he died, February 29, 2012. His natal Pluto was at 11 degrees Leo, which means that transiting Pluto was forming an inconjunct to his natal Pluto as well. Pluto is nothing if not transformative, and with the Leo and Sun indicators at play, this can certainly be symbolic of a massive life-altering event such as a heart attack. Transiting Mars, which can often act as a “trigger”, was at approximately 15 degrees Virgo (Virgo is related to health issues), thus squaring (stress aspect) Jones’ natal Uranus in Gemini, which opposed his Mercury in Sagittarius (so Mars was also squaring Mercury). From the reports, Jones began feeling unwell and his first symptoms were a sudden shortness of breath. The Uranus/Mars/Mercury connection can mean a sudden event affecting the functioning of the body systems which can cause them to function erratically or stop functioning altogether. His heartbeat or heart rate may have spiked or gone out of control as the attack began. Jones’ progressed Sun was square Uranus as well, a repeating theme and another indicator of a sudden, unexpected event that hit him at his core/heart (the Sun). Jones also had Jupiter transits occurring at the time of his death. Astrologically, this often corresponds to it being time for a person to go on their next journey. Jupiter expands whatever it touches, and in many cases, Jupiter transits show that the person is more than ready, on some level, to take that last trip. Davy Jones, the “Manchester Cowboy”, took his last ride into the sunset under these aspects on February 29, 2012.